Earth Day inspires millions of people around the world to take action on behalf of our beautiful planet. For some, this means getting out and volunteering for a day with an environmental group. For others, it’s about changing our daily habits to be more mindful about things like recycling, driving, or water usage. But a growing sector is taking earth-friendly action at scale. From nonprofits to NGOs to green businesses, visionary entrepreneurs are using modern technology to address Planet Earth’s very modern problems. Setting up a database is a relatively straightforward process (Heroku has an add-on for that), but getting it to run well in production is sometimes another matter. As your application grows and your data grows along with it, you will likely find a number of performance bottlenecks specifically related to your database, and this post aims to help you diagnose and address those issues when they arise. As with all components of your infrastructure it’s important to have early visibility into the performance characteristics of your database. Watching this data as your application grows will give you a much better chance of spotting performance issues and regressions as they’re introduced. Heroku has many public API endpoints. Each of these endpoints needs to be tested so that we know how they work, and documented so that our customers (and other API consumers) know how they work. 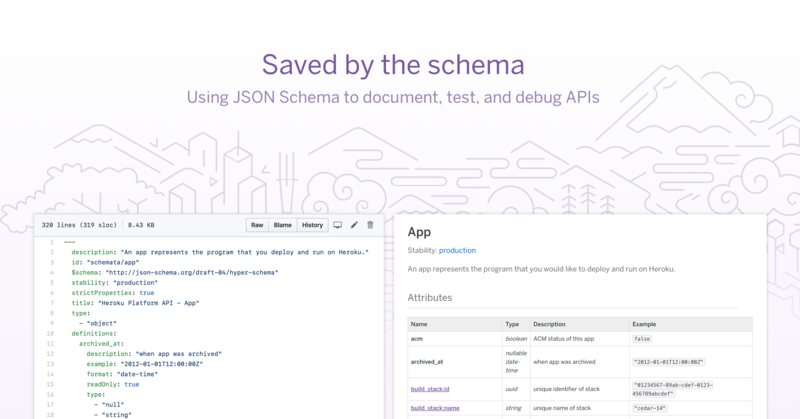 Follow along, and we’ll learn how Heroku uses JSON Schema to test and document our Platform API – and how it helped us uncover an unexpected bug, rooted in the way the Oj gem parses Big Decimals. JSON Schema files are like blueprints that define the structure and semantics of other JSON documents. When a JSON Schema file is applied to a JSON document, you can determine whether the document is valid (conforms to the schema) or is invalid (does not conform to the schema). When we open-sourced buildpacks nearly seven years ago, we knew they would simplify the application deployment process. After a developer runs git push heroku master, a buildpack ensures the application's dependencies and compilation steps are taken care of as part of the deploy.